Themesquad is ready to help you get the answers you need. Themesquad will reply to your questions about Get extension name shortly. We appreciate your feedback about your support experience with Themesquad, developers of Newsletter Subscription. This helps us maintain high standards on the WooMarketplace, and helps Themesquad improve. The best newsletter list to care about is the one that has all your past clients in it. Sharing content and special sales to reactivate all your past customers surely pays off as it takes up to 7 times less money to make a customer repeat a purchase than to obtain a new one. With WooCommerce Newsletter Subscription you may integrate into your checkout a checkbox that allows your customers to subscribe to the mailing list of your choice with one click. Moreover, you can configure a widget that will place a signup form in your sidebar or any other widget area. You can also take a look at your stats in no time with our simple yet effective dashboard widget. 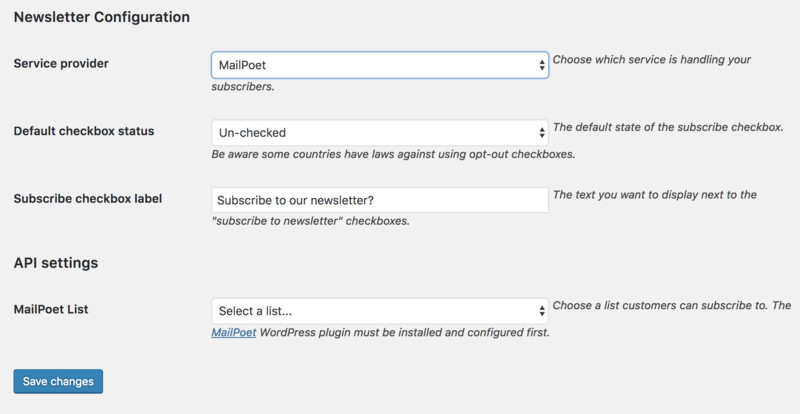 MailChimp, MailPoet and Campaign Monitor are all supported mailing clients. Gather your next recurrent customers in one mailing list that you can target with promotions and other actions to increase your sales. Integrates smoothly into your checkout. Create a new sales channel with people already interested in you in no time. Dashboard widget with the main statistics you need to keep track of your performance. 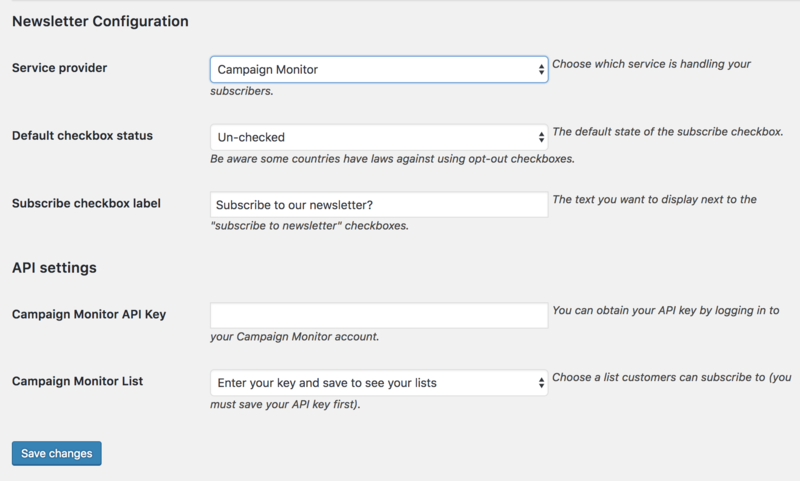 MailChimp, MailPoet and Campaign Monitor are supported. Newsletter Subscription allows the customer to subscribe to the mailing list of your choice with one click in case of the checkout checkbox and by only manually including the email in case of the subscribing widget. Check your numbers with a minimalistic dashboard that keeps you updated about the current trends and total subscribers of your mailing list. The newsletter subscription extension supports MailChimp’s Ecommerce360 service which allows you to gather further analytics on your email campaigns with regards to purchases. Do You Use AWeber Email Marketing? We got you covered. If you are an AWeber Email Marketing user, go to our AWeber Newsletter Subscription extension page to get yours! WooCommerce Newsletter Subscription is a powerful plugin that provides MailChimp integration with Ecommerce 360 and Merge Fields. It uses latest MailChimp API to automatically subscribe customers and has Ecommerce 360 compatibility to track sales back into MailChimp. You can use it as a simple e-mail subscription plugin or capture data of purchase for up selling and targeted customer automation mailers from MailChimp. With the amazing opt-in settings of this plugin, you can choose whether you want to subscribe the customer after their purchase automatically. You can choose either single or double opt-in (customer has to confirm before subscribing). This plugin will enable you to make custom labels for subscription form which will be displayed on checkout. WooCommerce Newsletter Subscription plugin comes with Ecommerce 360 enabled. The customer purchase will be automatically sent to MailChimp. Merge tags enable you to add fields such as Role, Country, Purchase Value, etc. to your MailChimp list. The fields will be automatically fetched. It has easy mapping features. WooCommerce Newsletter Subscription recommends latest PHP 7.0+ and WordPress Versions. Minimum requirements – PHP 5.4+, WordPress 3.5.1+ and WooCommerce 2.2+. Online documentation is available via our GitBook. WooCommerce Newsletter Subscription support forum on WordPress.org for basic support and help from other users. Since this is a free plugin, we respond to these as we have time. For Professional and Quick Support (Including Customizations and Addons), Pro Product is available WooCommerce Newsletter Subscription Pro. 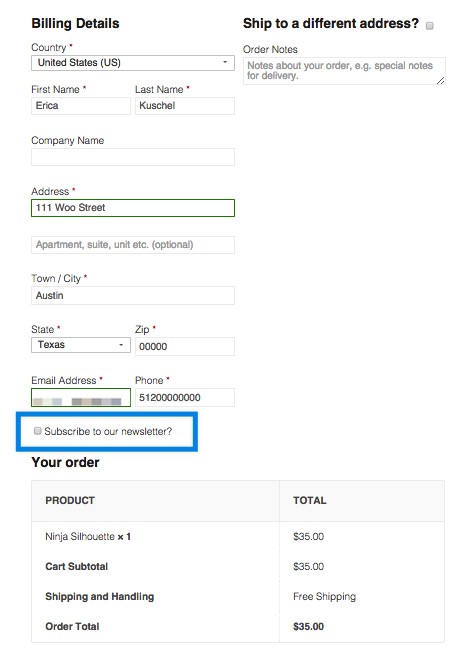 WooCommerce Newsletter Subscription general settings screen. Upload or extract the woocommerce-newsletter-subscription folder to your site’s /wp-content/plugins/ directory. You can also use the *Add new- option found in the *Plugins- menu in WordPress. Enable the plugin from the *Plugins- menu in WordPress. 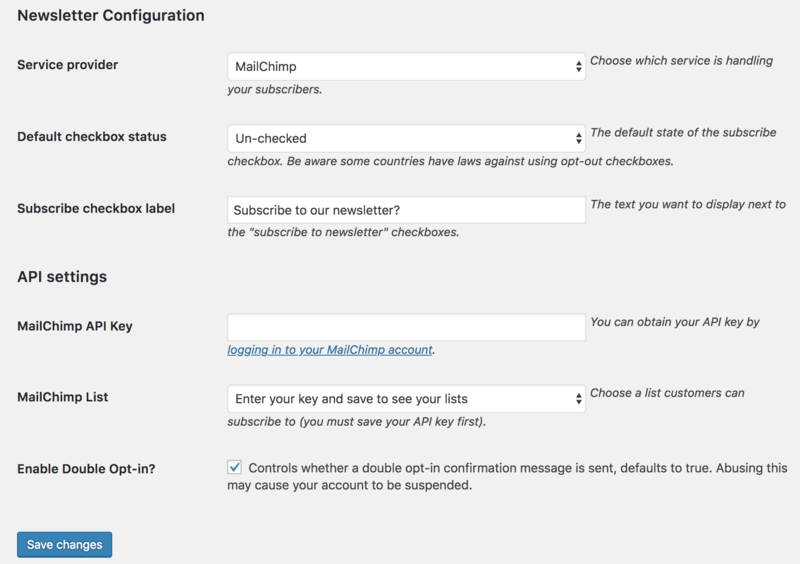 First, paste your MailChimp API Key and hit Save changes to get started. Next, select your MailChimp list. Select your opt-in, double opt-in settings and hit Save changes . That’s it, your WooCommerce store is now integrated with MailChimp! We also provide newsletter integration of Campaign Monitor as an add on for this plugin. Complete online documentation is available via our GitBook. “WooCommerce Newsletter Subscription” is open source software. The following people have contributed to this plugin. There is a dashboard widget that displays recent subscriber activity and a widget for placing a signup form in the sidebar or any widgetized area. Additionally this extension includes integration with MailChimp eCommerce360 tracking and uses version 2.0 of the MailChimp API.